Manager Sean Dyche has told Burnley that he will not allow them to lose the momentum gained from three consecutive Championship victories. lifted the Clarets up to seventh in the table, four points off a play-off spot. "We don't get carried away," Dyche told BBC Radio Lancashire. "We're enjoying the nice run we're on, we're deserving of the run we're on, and long may it continue - but we've got to work hard for it each week." Burnley have won seven of their 15 league matches under Dyche since the former Watford boss took over at Turf Moor in October. "There was endeavour, good shape and great quality at times. "When I came here, I spoke about pride in the shirt. That has to be a given, and it's coming. You can see the amount of effort the players are putting in." 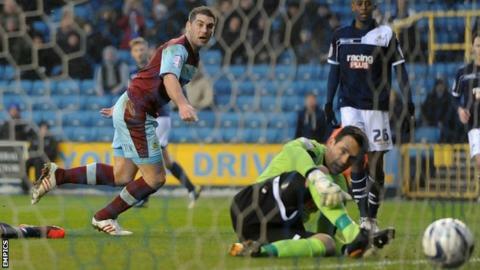 Goals from strikers Sam Vokes and Danny Ings at the New Den gave Burnley three straight league wins for the first time since December 2011.